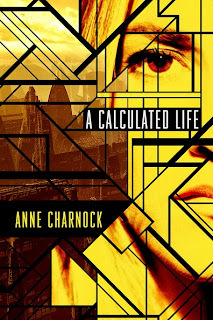 Today I chat with Anne Charnock, author of A Calculated Life, a Dystopian vision of corporate life in 21st century, which releases this week. We conversed about her switch from journalism to fiction and the ups and downs of the writing life. Neve: Anne, congrats on your debut novel -- I'm looking forward to reading it! What prompted the switch from science journalism to science fiction? Was fiction writing something you had always wanted to try, or did you wake up one morning with the idea for A Calculated Life and it took off from there? Anne: Thanks! … In my journalism days I didn’t think I could make the leap to fiction. I thought the discipline of writing news and features - to an exact number of column inches - would make my writing too tight for fiction. But I took a break from journalism and studied fine art for several years during which time I was asking the question, What is it to be human? My studio tutor nudged me into writing a short story. I realized – my thunderbolt moment – that I should try to answer my question by writing a novel. That’s when I started writing A Calculated Life. I studied environmental sciences when I left school – a good generalist starting point for journalism. But you are a proper scientist, Neve. Tell me more about that and how that specialist knowledge fed into your writing. Neve: I started my career as a research engineer before switching to fiction writing. Both are creative endeavors, but in science fiction you don't have to stick to the rules of this universe. You can be as inventive as you like! I had to learn to ignore that inner voice which I developed in my graduate studies, the one that kept bringing up issues like Shouldn't Felix (the main character in Regarding Ducks) need to use the bathroom? Isn't he hungry? How does he know anything for sure? Science is built on a rock-solid foundation, brick by brick, but fiction isn't like that. You get to do more hand-waving. Nowadays, the copyediting stage of things, when you're proofreading and double-checking what you've written, is the part of publishing a book that I probably enjoy the least. I think I revert to my engineer self and worry I'll discover a big flaw or something. Anne: I agree with you on the copyediting. It’s the final checks on punctuation that I find frustrating. You know those little issues like: should this question mark be in italics? Punctuation and grammar are pretty standard for business reports, formal letters and so on. It’s not so fixed when you’re writing fiction – interior monologue, for example – but you still have to be consistent. The part I enjoy the most is when I’m in the midst of writing a story, when I’m not sure where it’s going, when I’m happy to go with the flow. And I particularly like writing dialogue. I think that’s partly because I lived in a noisy household as a child – four brothers, a sister, and five cousins living next door. There were so much bantering going on, lots of interrupted speech! How about you Neve? With your third novel nearing completion, you must know what kind of writing comes easiest to you. Neve: It's dialogue writing for me as well. That's the part that flows the easiest, where you get to know your characters. In terms of the writing process as a whole, from blank page to publication, the part I enjoy the most is when you have that first draft done and it's starting to look like a book... and now you get to sit down with a red pen in hand and make it a stronger book. It's when the story finally comes together. Do you find that as well, Anne, that it's not until the very end that you figure out what the story has been about? Or are you a more organized writer than I am and work from a detailed outline? It seems like that would be faster. Anne: Yes, I have to admit that during the first draft there are difficult times when I feel like I’m pulling my own teeth out. I like the process of refinement, which takes place as you know, Neve, on many levels – improving each sentence, adding scenes, scrapping a character. Brutal stuff. Moving a scene is more problematic because it has a ripple effect through the manuscript. I changed my opening scene twice. I didn’t delete those earlier opening scenes – I moved them. I certainly don’t outline. But once I have the first draft, I try to be strategic in working out how to clarify my themes by the addition of new sections or by modifying passages of dialogue. That’s good fun and, of course, at that stage I’m not thinking about marketing the book. In the UK, it has been difficult for women science fiction writers to get publishing contracts in recent years. So it was a huge relief when a US publisher, 47North, approached me. What’s the situation in the US? Do women SF writers feel they’re increasingly out of the loop? Neve: I hadn't heard that about UK publishers, that's maddening. Personally, I never got to be rejected by publishers -- I couldn't get past the agent gatekeepers! The feedback I got from agents about Regarding Ducks (when I got feedback) was that they thought it was well-written and interesting... and too experimental to pitch to publishers. So I, too, was glad when Amazon Publishing found me (through the Amazon Breakthrough Novel Award contest). Did you send your manuscript to agents or publishers at all, Anne, or did you go straight to self-publishing? How did you make that decision? As to whether women SF writers in the US feel left out of the loop, I suppose I'm out of the loop by definition: I spend most of my time at my desk, have been to only two conferences (neither SF), and am not a member of Science Fiction Writers’ Association. You hear and read things, of course. I think it's great that nowadays we have more paths open to us as writers than we used to. Anne: With my novel released this week, I’m planning to stay at my desk, too. I’ll follow your example. It’s time to pick up the pace with my story writing! However, I will go to some conferences next year – I always go to the Hay Literature Festival on the English/Welsh border and I’ll blog about various author events as I did this year. But before Hay, I’ll be going to Norwescon in Seattle, which I’m already excited about. I did try the traditional publishing route, Neve, without success. I received positive feedback from several agents (and one publisher that I approached direct) but no one signed me up. I knew that publishing houses were starting to pick up self-published titles and that made sense – the market had already tested those titles! So I took the plunge. It involved a humungous amount of work, and as an indie-author I had to find ways to become visible! So I used my journalism experience to start a blog and that’s been a fab spin-off because I love posting. And I also blog for The Huffington Post. From now, I have to get the balance right between blogging and writing fiction. So, agents found your work too experimental. Would you like to expand on that? And tell me more about the sequel you’re writing. Neve: I am glad you found a route that worked for you, Anne! Are you working on a new book these days? As for my own stuff, I didn't feel it was too experimental (for all I know, maybe that was just a polite way for agents to turn down representation). In any case, I have to say I'm glad to be past that stage and can now focus just on the writing. Well, other than obsessing about reviews, sales numbers, my Amazon rank, and so on... The sequel to The Far Time Incident has just gone through its copyedit -- only 5 months to go before publication! Anne: I’m writing short stories at the moment because I want to try out a few ideas without committing to a full novel. But I expect I’ll start the next novel soon. I can feel the itch to get started on a big project. Any advice for a debut novelist about to start on the second novel? Neve: I'd say what I've found tricky is time management, especially with a series. You're doing publicity and marketing for the first book while writing the next one and coming up with ideas for the one after that. It's a lot of balls to have up in the air. Good luck with the book launch this week, Anne, and good to talk to you! Anne: Thanks! Let’s hope we can meet up sometime – maybe at Norwescon. We do have to come out our caves occasionally!